Joe Bonamassa Plays My Guitar – Holy Crap! You know what’s cool? A job where you repair and make guitars for a living. That’s pretty cool. You know what’s even cooler? 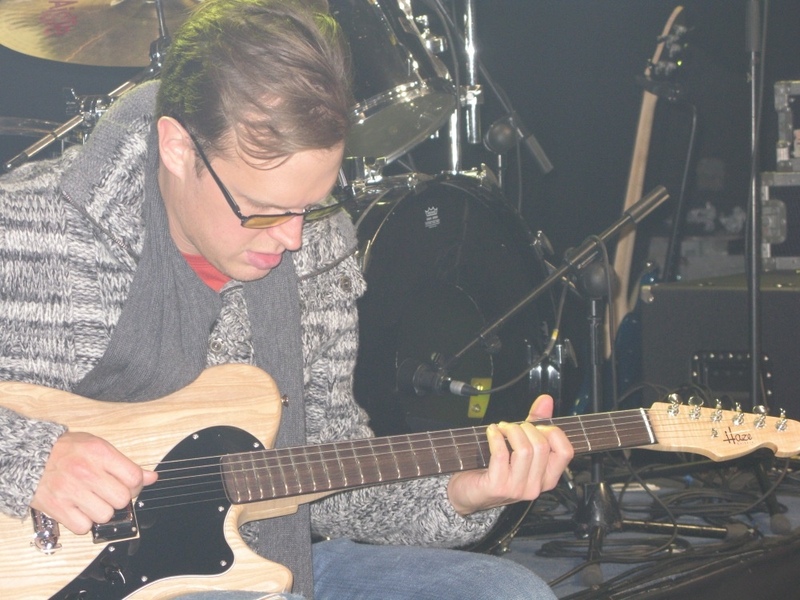 Getting to see and hear Joe Bonamassa play a guitar you’ve made. To be honest, it doesn’t come much cooler than that. 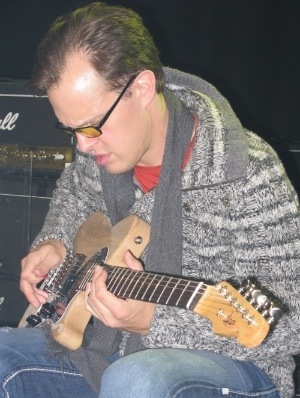 Last week, I met Joe Bonamassa before his show and presented him with his very own Haze Guitars instrument, hand-made by my good self. It was nerve-wracking to say the least but it all went rather well and I think Joe was happy with the latest addition to his guitar harem. Given that I had a free-reign with this guitar, I decided to try think differently. My thinking is that Joe isn’t exactly short of guitars and so this instrument needed to be something a little bit more unconventional. To that end, I eschewed the lavish and sumptuous type of thing and made Joe quite a workmanlike guitar and – I think – one that many might not associate with him. Effectively I decided to try stand out by virtue of leaving out any fanciness. If I’m completely honest, the fact that I had a limited amount of time to complete this guitar played a part in this decision but, like I say, Joe’s already got plenty of solid gold axes with platinum hardware and strings woven from the hair of beautiful virgins. This is a no-muss-no-fuss guitar. A slab body and a single pickup – back to basics. The body is ash (and a good solid example of it). 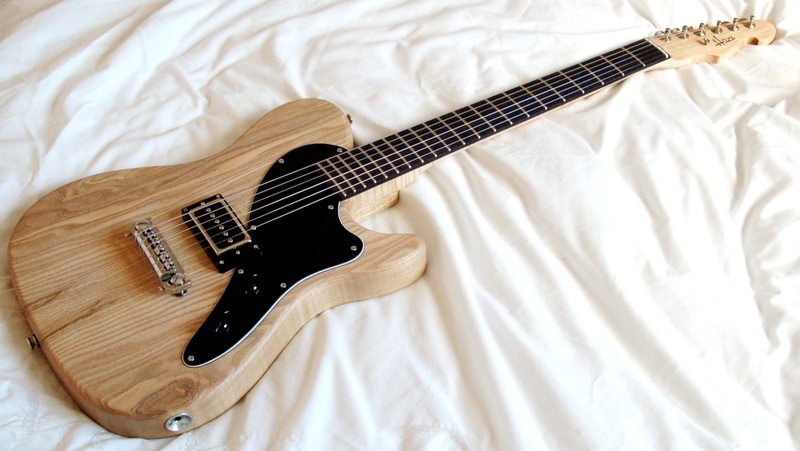 The body-shape inspiration is relatively easy to spot but the actual size of the body is smaller than a Telecaster and the lines are altered – the waist is narrower and the horn and upper bout lines are different. A black-white-black pickguard holds the volume and tone controls – chicken head knobs for each, in keeping with the no-frills approach. The guitar is fitted with a wraparound Tun-O-Matic style bridge which gives great coupling and sound transfer. This does require that the neck, which is a bolt-on in the usual fashion, be installed at a bit of an angle – coming back towards the player in a comfortable, Gibson style. This guitar’s neck is maple and the fingerboard rosewood, installed with 21 wide/high frets and a bone nut. The neck itself is chunky – Joe likes a handful – although it’s carved slightly asymmetrically with more of a curve along the treble side. This makes it feel like it has a little less bulk than it actually has. Action is left slightly on the high side, again to suit Joe – he told me he likes a guitar to fight him – and it’s strung with 11-52 gauge strings. The noise comes courtesy of a single Duesenberg Domino pickup. This is where things move in a slightly divergent direction. The Domino is Duesenberg’s attempt to shoehorn a P-90 pickup into a humbucker-sized housing. It looks fantastic; all chrome and black and it sounds really fantastic. It’s not quite a P-90 (it gets a lot of the way there) but it has an amazing tone all of its own. It’s raw and powerful without being shrill or getting too messy. I love the wonderful noise it makes and Joe (thankfully) seemed to be quite taken with it too. There’s quite a bit more sustain in this guitar than you’d normally expect from a T-type instrument and, even acoustically, this guitar rings quite nicely and cleanly. Powered up, the Domino keeps things from getting too glassy, filling out the sound but still keeping an edge in the highs. The tone is quite full but there’s plenty of definition and always a slight hint of raggedness. Personally, I love it and may well have to build one for myself too. Joe’s got a great ear by the way and is very knowledgeable about guitars. He spotted little things right off the bat and we were able to chat about the impact they had on the ultimate sound of the guitar. Joe played for quite a while before his manager reminded him he needed to get some dinner before the show. I’d have happily sat and listened to him for hours. All in all, I’m pretty damned happy with how presenting Joe with an instrument made by Haze Guitars went. Joe genuinely seemed to like the guitar (and I really hope he did) and said a lot of nice things. He was also really generous about letting me snap gushing, fanboy, photos as he played. Custom guitars aside, it was great to just hang out with Joe and have a chat about music, guitars, touring, fish and chips, etc. Yeah, we really did talk about fish and chips. Random, eh? 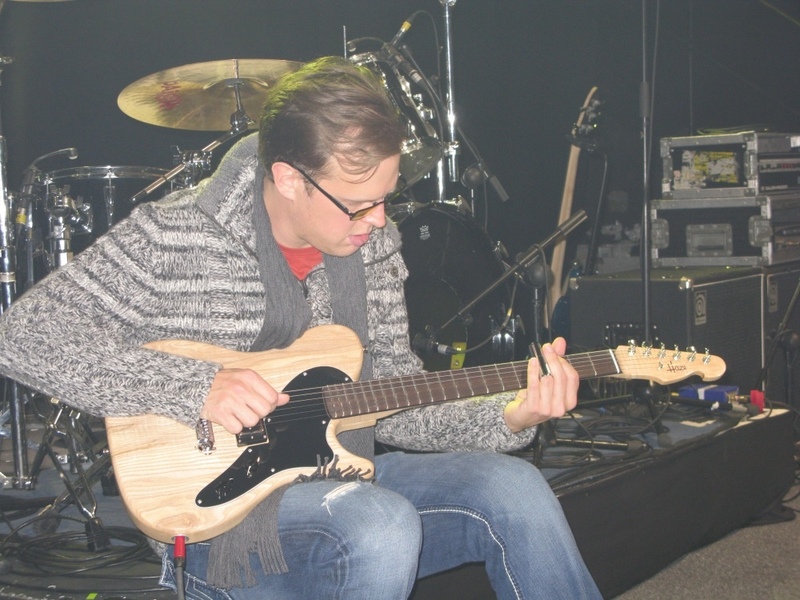 It’s amazing to know that this guitar, made by me, has joined Joe Bonamassa’s stable. I realise that’s a big stable but even thinking that he might pick it up every now and then, just for a noodle about, is a great feeling. Anything more than that would be a crazy bonus but just thinking that’s enough. More than enough.